File this one under "Well OF COURSE that's what they'd do." 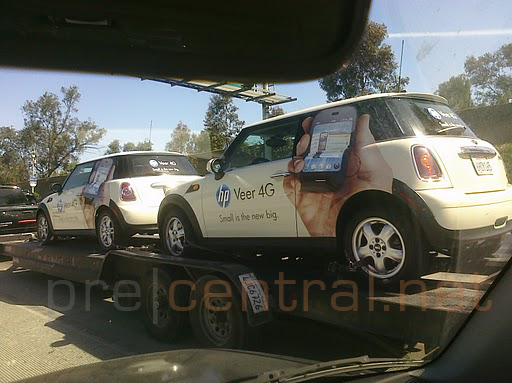 PreCentral reader James was driving along the freeways of Los Angeles and spotted a trailer towing along two Mini Coopers done up to promote the HP Veer with the tagline "Small is the new big." 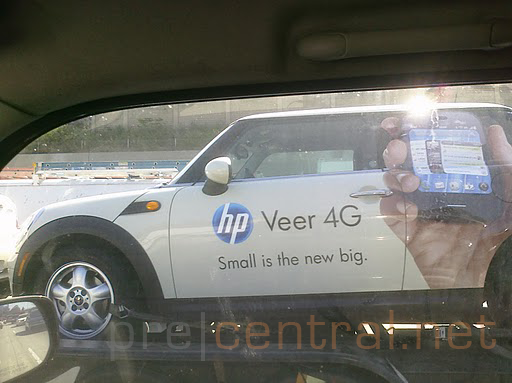 Actually, they're done up to promote the "Veer 4G." We've seen that "4G" piece before, in that now-pulled "Selling webOS" app that snuck its way into the public last month. We knew that the Veer will be a fully-capable HSPA+ device (assuming, of course, that AT&T doesn't prevent it from having full HSUPA for uploads), so by AT&T's recent naming conventions it's not a complete surprise that they're going to market it as a 4G device. Whether HSPA+ on AT&T (the carrier we're presuming it will hit) actually deserves to be called 4G is an argument we'll leave to others. Instead we'll just bask in the glow of new HP marketing vehicles (ahem) and hope that James is right in thinking they mean a launch is imminent. One more shot after the break.